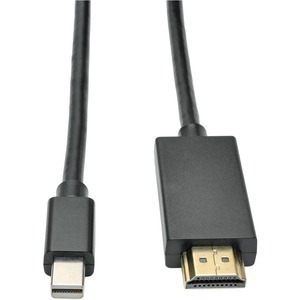 Mini DisplayPort to HDMI cable adapter lets you connect a computer with a Mini DisplayPort video output to an HDMI-enabled monitor or TV. Advanced design sends both video and audio signals for seamless operation. Male-to-Male construction eliminates the need for a separate adapter and cable. 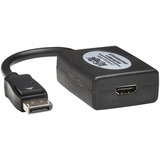 In-line passive adapter is designed for use with dual-mode (DP++) DisplayPort graphics cards. 12' cable supports 1080P video resolutions up to 1920 x 1080. Tripp Lite 6in DisplayPort to HDMI Adapter Converter Active UHD DP to HDMI 4K x 2K M/F 6"